Apple on Thursday shared three promotional videos touting the new enhanced edition of "A Song of Ice and Fire," on which HBO's hit show "Game of Thrones" is based, which landed as an exclusive in the iBooks Store in September. 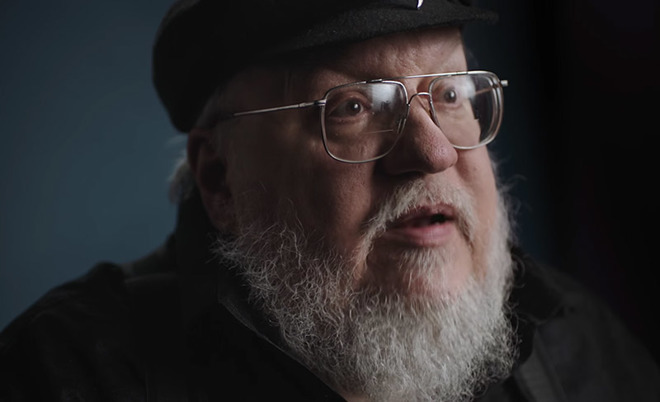 As seen below, the new promo videos feature snippets of a fairly in-depth interview with author George R. R. Martin, who runs through a bit of "A Song of Ice and Fire" backstory and offers a taste of his epic by narrating select lines from the first tome, "A Game of Thrones." Interspersed throughout are stark watercolor illustrations of pivotal moments and themes central to the series. "There's a line in the books where I say, 'The reader lives a thousand lives before he dies. The man who does not read lives only one,' and for me that's been true. The life of the imagination has made my own life much richer," Martin says. "It allows us to walk to the forests of the night, and see wonders and terrors. It's painted in broad strokes." Martin goes on to describe the beginnings of "A Song of Ice and Fire," explaining his attempts to convey to readers what he sees in his head. With digital technology the storytelling process is greatly enhanced, allowing authors to create fully fleshed out realities far beyond what is possible with traditional publishing. For example, Martin's enhanced iBooks editions feature special illustrations, secondary material and more. "These enhanced editions include sigils and family trees," Martin says of the enhanced e-books available on the iBooks Store. "They also contain all this background material and glossaries. Anything that confuses you, anything that you want to know more about, it's right there at your fingertips. It's an amazing next step in the world of books." The first of Martin's enhanced editions, "A Game of Thrones" hit the iBooks Store in September and now sells for $8.99. "A Clash of Kings" went up for sale in November and was followed by "A Storm of Swords" earlier this month. The latest editions are priced at $11.99. Apple's iBooks Store will gain access to "A Feast for Crows" and "A Dance with Dragons" in February and March of next year, respectively.